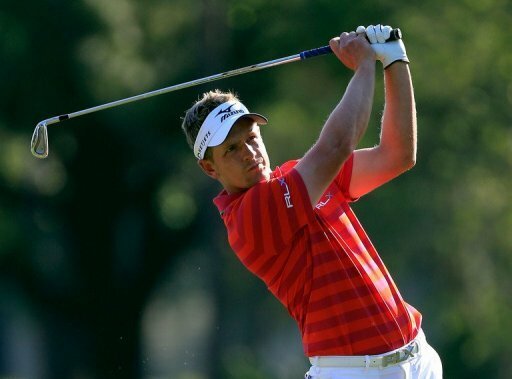 Luke Donald of England plays in the Tampa Bay Championship in Palm Harbor, Florida, last week. Donald says losing golf’s number one ranking has had a silver lining, by allowing him to prepare for the coming Masters championship free from the glare of the top-rank spotlight. Luke Donald said Tuesday that losing golf’s number one ranking had a silver lining, by allowing him to prepare for the coming Masters championship free from the glare of the top-rank spotlight. Donald, in Kuala Lumpur for this week’s Maybank Malaysian Open, said the tension and pressure of defending the top spot can be a distraction when preparing for important tournaments. The Englishman is yet to win a major. “Naturally the whole point in being the best is to be number one, best player on the planet, and that is where I want to be too,” said Donald, now ranked third in the world. This year’s Masters tournament, considered by many to be golf’s most coveted title, will be held April 11-14 in Augusta, Georgia, in the United States. Donald assumed the number-one ranking in May 2011 and held it for nearly a year until he and Northern Irishman Rory McIlroy traded the spot several times, with McIlroy taking over for good last August. Tiger Woods of the United States is now ranked number two. Donald said his form has been on an upswing, noting his recent tie for third at the Tampa Bay Championships. “I am looking forward to (the Masters) and in recent weeks my game has come together well enough to give me confidence in doing well next month,” he said. Donald will make his debut in the $2.75 million Malaysian Open, which begins on Thursday and will be his fifth tournament appearance this year. He is the highest-ranked player at the tournament, which will include three-time major winner Padraig Harrington of Ireland.